I have a confession to make: I love Kid Rock. Not the current version that crawled out of the sludge of Republican racism and misogyny to make us all laugh bitterly by his wanting to run for office, and not, to be more specific, any other version, persona-wise. I love late ’90s, early 2000s Kid Rock, and I love him exclusively in his sung persona. I love “Bawitdaba,” his first and probably biggest hit, in terms of bubblegum stickiness. 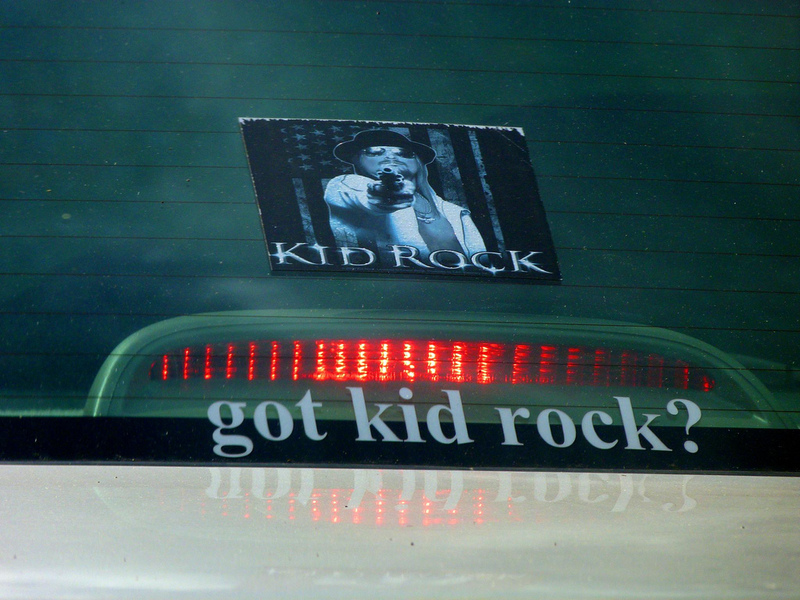 I remember sitting on the bus in high school listening to my nemesis wail the song’s “My name is Kiiiiiiiiiiiiiiid—Kid ROCK” line as long as he did and longer than I could. I love “Picture,” his surprisingly soulful duet with the great Sheryl Crow, a song that was a karaoke standby of mine for years; I would happily belt out both parts if I couldn’t procure a dude to sing with me. (And you know what? His part was too hard for some of them to manage.) I love “Cowboy,” which includes the line, “Straight outta Compton? I’m straight out the trailer.” I still rock out to these songs when they come on in a bar, but the difference between the me of 2007—the height of my Rock fandom—and the me of 2017 is the constant whirr of critique I have going when I listen to his lyrics (and the strenuousness with which I fume at anything he actually says). I am here to defend the practice of tearing down something artistic that you love. Performing the act of critique doesn’t mean you categorically or wholly hate a thing. You can like or even love problematic work or the work of a problematic person and still critique it; those attitudes don’t cancel each other out. If we ignored all culture created by problematic faves, we wouldn’t be able to converse in the cultural vernacular of a white and cishet-dominated media landscape, one which has always invented histories for itself; I’d be willing to bet that most (white) Americans still—wrongly—believe that Elvis pioneered rock ‘n’ roll. I love Elvis, too, and yet every chance I get—pretty frequently in the rock ‘n’ roll-themed writing and literature classes I teach—I like to remind people that Elvis is an appropriator just like every other white rock star; indeed, he was one of the best at it. He drew from the creativity and talent of black Americans, and he was the one who reaped the biggest benefits. The same theory of garbage goes for misogynistic Trump-supporter Billy Corgan—and I own a copy of his shirt. His new track “Aeronaut” is lushly gorgeous and light; it would be perfectly at home on side B of Mellon Collie and the Infinite Sadness, across from “Galapogos.” He appears to have picked up some vibrato, even, since re-forming the Pumpkins—or since I listened to any new work of his post-Zwan, who, yes, I did see in concert. “Aeronaut” lives on his solo album, Ogilala, which, true to his race-baiting form, inexplicably features a Native woman and baby on the cover. And it’s not just political angles that make faves like Corgan particularly insufferable. He fancies himself William Patrick Corgan now, but even going by three names isn’t pretentious enough for him: he’s got to use three initials on the album cover, as though you know exactly who he is without the rest of the letters of his name. Doesn’t quite sound like a denizen of “the bareknuckle world” he claimed, last spring, to Alex Jones, that he inhabits. He sounds more like a “broken pinata,” as he groused to Vice in 2014, but instead of pitiable, as he seems to have intended, the comparison makes him sound ridiculous. I love “Friends,” too, and it is utter trash according to almost any socially conscious angle—which, I believe, are the most important angles to take in our unendingly racist, misogyno-bigoted country. No matter which angle you choose, the show is garbage: from the unbearable whiteness of almost every character in the series to the blatant, running homophobia and transphobia, to the tokenization of Black and Asian characters, who never appeared for more than a handful of episodes in a row. So why watch it? Well, as my college classes prove, it’s a wonderful teaching tool against all of these things, especially when put in conversation with current intersectional and introspective comedies like “Black-ish,” “Fresh Off the Boat,” “The Good Place,” “Insecure,” and “Atlanta.” Earlier this year, Jay Z used an incredible parody of “Friends” as the video for 4:44‘s “Moonlight” featuring some of the best actors on TV and in movies today: Issa Rae, Lakeith Stanfield, Tiffany Haddish, Jerrod Carmichael, Tessa Thompson, Lil Rel Howery, and Hannibal Buress; Alan Yang, co-creator of “Master of None,” directed it. (A “Friends” co-creator whined in response to the Hollywood Reporter that he didn’t “have TIDAL” and so was unable to see it.) The genius of the “Moonlight” video is how it points out the original show’s unbearable whiteness just by recasting it with Black actors, making both a parodic and a political point. So why put up with Rachel Green’s learned helplessness, Ross Geller’s unbearable holier-than-thou attitude, or any resurgence of whiny white male rock stars, in song or in politics, especially when you’ve got Lakeith Stanfield’s brooding genius and Issa Rae’s punchy singularity, deservedly rising both of their stars? It’s possible to engage with art and leave the artist’s bad personal politics aside, of course: you should not feel any need to listen to Rock or Corgan talk through their racist and xenophobic bilge if you don’t want to. But it’s hard then to determine where the line gets drawn: why do I, for example, rewatch Kathleen Turner caricaturing a trans woman on “Friends” and refuse to do the same with Bill Cosby’s stand-up in the wake of over 50 women having accused him of sexual assault? Whose politics have to be dropped and whose are slippery enough to slide through? Why not just reject all of the problematic stuff and move on to better, less offensive things? While determining for yourself what you won’t engage with is important, there’s also a socially determined level on which that can happen, and the failure of Cosby’s once-shining career, from lost advertising to cancelled shows, is a really strong example of that. For me, the personal answer is that I can only love the hateable stuff because I tear it down. The act of critique engages with the context of (in)justice just as it acknowledges that sometimes an artist isn’t telling their complete truth. And I draw my own lines on what to engage with and what not to, which artists to avoid and which to keep around, just like most of us do. I let Kid Rock off the proverbial hook for a while because it was easy to ignore the things about him I didn’t like. There were a lot of lyrics I wondered about, and the Confederate flag-waving I saw at his concert made me queasy, but I was able for a time to set those things aside. As I’ve done more interrogating of my own responsibility to speak out, I’ve realized how lulling those acts of ignoring can be, and how important it is to push against them. In the immortal words of Hoobastank, I’m not a perfect person. Neither are you. But we all—well, except for so many of our faves—do our best, and we like what we like; what matters most is what we do with it. So scream away in good conscience; I’ll be screaming next to you.